Nora hopped off her stool and stretched. She didn't need to stretch, but the human habits she'd become accustom to using in order to fit in among humans hadn't worn off yet. 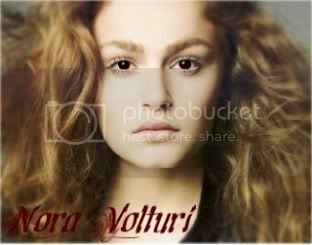 She began cleaning up the art studio; the studio was available for all the Volturi to use, but Nora was the most frequent user. Art helped Nora cope with her gift - the ability to "see" other people's memories as well as store them in her own mind, alter them, or show them to others - by letting her get images out of her mind. The gift had been what helped her become a guard when she first came to meet the Volturi at the end of the Victorian era. Nora hadn't come to the guard by herself - she had been brought by another guard after getting into too much trouble in the human world. Aro found that Nora's gift made her an excellent spy and he used an long term, extended mission as her repayment for her mistakes. Nora still completed extended, undercover missions for the Masters; she didn't hate the missions, but acting human was a lot less exciting than combat. Actually, Nora had just returned from a 3 year mission in the southeast region of the U.S and was looking for something other than painting to entertain her. Luckily, she didn't have to wait long. There was a new vampire at the castle. Nora wandered out into the castle hallways in hopes of encountering the new vamp. "I wish to join the Volturi," The girl whispered in a voice that was barely audible. His gaze shifted to watch her lips as she bit into them nervously. "I hope that my power would be beneficial to the Guard, and I also hope to expand my gift while in my service." "Are you absolutely sure?" Demetri inquired, raising an eyebrow. "Once you join, you're stuck with us forever, you know." He laughed quietly before his face suddenly fell serious. "Isn't that right, Matilda?" Demetri added dryly, whirling around to stare at something hidden in the shadow of the corridors. "Really, you need to find a better way to be more stealthy." "Are you absolutely sure?" the vampire asked, eyebrow raised. "Once you join, you're stuck with us forever, you know." He gave a quiet laugh, before his demeanor became serious. Elena knew what his change in mood was, another vampire had joined. Elena became more weary of her company. If things where to go awry, she was out numbered now. "I am sure," she replied. She decided it best not to show her nervousness of being out numbered. In turn, her voice was nonchalant as she spoke. "It's not like I have anywhere else to go. I may as well make myself useful if I am to live for an eternity." There was another reason she had decided to join the guard. For the company. Living as a nomad, her life had been considered dull and lonely at best. She yearned for companionship... though of course, she knew she would never again have the true companionship of her deceased love. But still... her life as a vampire had been a solitary one, but with the guard, she would at least have others around her who she wouldn't have to hide totally from. Elena had occasionally tried to have human companions... just out of a whim of loneliness... of course, none of them ended well... especially around the time she needed to hunt. Matilda's eyes flickered with amusement before they shifted to the new girl and studied her. The lights that surrounded her vision moved with her. Another vampire with a power...Matilda had wanted to know what that power had been exactly but Demetri had refused to tell her, naturally. "Don't even bother with that one." She heard him say to who she guessed to be Elena. "She doesn't talk much...not sure as to why but she doesn't. Just...be careful if you two ever have to brawl. She's stronger than she looks and she's remarkable at cheating death. Which I personally don't find fair, but we aren't fair people regardless." He smirked. A shard of green light appeared from Elena and Matilda's hand lifted to manuever it into her line of vision. Huh, she did look an awful lot like Elena from the Vampire Diaries, Matilda thought as she craned her head to look more closely. Elena lips turned up on her own accord. "Sounds like you know from personal experience." she said, for a small moment acting like her normal self. Instantly, she noted her mistake, hoping the comment didn't imply that the vampire in front of her was was weaker then the female vampire behind him. She bit her lip again, her eyes shifting around her, alert in case any others were to come her way. She had to be more careful... at least until she was seen as one of them... She knew that if she where to mess up... or to offend any of them... her chances of joining... or even living would be over. 'Gah! I wish you were here...' she thought, thinking of Zerick. He had been the object of Elena's love in her human life. He was a vampire, and yet he loved her... but now... he was dead, leaving Elena, now a vampire, to fend for herself. Elena wished that he could help her. He was always smart, witty, handsome, and polite... He had ways of persuading others, that Elena could never hope of doing... And now... it didn't matter. Because he was dead. Elena shut the mental door on her thoughts. No, thinking about him was too painful... it was best to move on and forget... Of course, Elena knew that was impossible- the forgetting part. Because for a girl who sees the past, it's almost impossible to move on to the future. Matilda choked down a laugh, causing Demetri to throw her a look that didn't make it any easier. "Which doesn't mean I don't try to kill her...because believe me, I do." He joked before leaning away from the post. "Unfortunately, before we can take this little chat any further, you have a meeting with Aro." Demetri turned to face Elena. She didn't respond at first and Matilda shifted to look back at her. She seemed to be thinking hard about something. A blue light broke free from her constellation and hurried over to Elena and rounded her. Matilda tilted her head. Hm. "Elena?" Demetri called again, this time the girl looked up and gave him a polite smile before nodding. Matilda moved from the shadows to walk behind them before she had time to investigate it any further. Not that she suspected that the new guard would make a run for it. It was purely precautionary measures. She beckoned the blue light near Elena's head over and it was a few moments before it reluctantly moved back into her collection of lights as they continued walking. Nora followed the voices through the castle hallways, finally turning a corner to see Demetri and the new face pass on the other side of the room. Matilda came from the shadows and began to follow the pair; Nora zipped over to Matilda hoping to find out some details - she wasn't about to interrupt Demetri in taking the new vampire to, presumably, see the masters. "Hi Matilda. Who's our new friend," Nora whispered in attempt not to cause too much of a distraction. Matilda picked up the glowing of a green shard before she turned her gaze to see Nora. "Hi Matilda. Who's our new friend," Nora whispered in attempt not to cause too much of a distraction as she walked to join them. "Elena. A new recruit for guard." Matilda mused back at Nora, her lips pulling into a warm smile before she fell silent again. "Nora, glad you can join us. You know how Aro loves an audience." Demetri greeted, not bothering to turn back to look at her. Elena was deep in thought when she realized that Demetri was addressing her. "Elena?" he questioned again. Elena turned her attention to her surroundings. Everything was antique, from the stone walls to the simple furnishings. She became conscious once more, of being careful not to brush by anything with her skin. She wanted to be conscious of what was going around her in the present, and touching something would be counter active to that. "There you go again. Not touching anything." Demetri noted with a smirk before they arrived at two very large wooden doors. Suddenly, there was an agonized scream from beyond the closed doors that sounded almost animalistic. Demetri reflexively side stepped, pulling Elena by the hand as the doors swung open, revealing a headless body as it tried to straggle away. Matilda caught it roughly by the collar of it's shirt and hoisted it up. "Lovely." Demetri mused as he looked over the body that flailed helplessly against her grip before he turned to Elena. "After you, bella."